Oklahoma teachers will walk out en masse this coming Monday, despite a historic agreement from the ailing state legislature to give them a long-overdue pay raise which will be paid for by increasing taxes on the state's previously untouchable oil and gas industry. Oklahoma is a financial basket-case, ruined by Republican orthodox economics, producing a state that is so broke that school districts have switched to 4-day work-weeks so teachers can make ends meet by working second jobs as airport baggage handlers and fast-food workers. The state's neoliberal policies -- which began with a Clintonite Democratic legislature, and were supercharged by subsequent GOP legislatures who waltzed into office after the Democrats sold out working people -- have produced the lowest tax rates on the oil and gas industry, a state rule that only allows tax hikes with a 75% majority of the legislative votes, and some of the worst-paid public servants in America, especially teachers. Earlier attempts to stem the tide of teachers fleeing for higher-paying work elsewhere have been a joke, with GOP legislators offering to find the additional funds by raising taxes on the working poor -- not the oil industry and the wealthy. Public sector trade unions have been gutted by GOP law, leaving workers unorganized; but after the examples in West Virginia, the rank-and-file self-organized on social media, coming up with a platform that was much more radical than any traditional, compromise-oriented union leadership would have gone along with. So when the GOP-dominated legislature finally caved and sent a bill to the governor's desk that would have given a substantial pay-hike to teachers by taxing the oil and gas industry, the self-organized rank and file decided to go for the brass ring: they're going to walk out on Monday anyway, and they're vowing to stay out until the whole of Oklahoma's public sector gets economic justice. 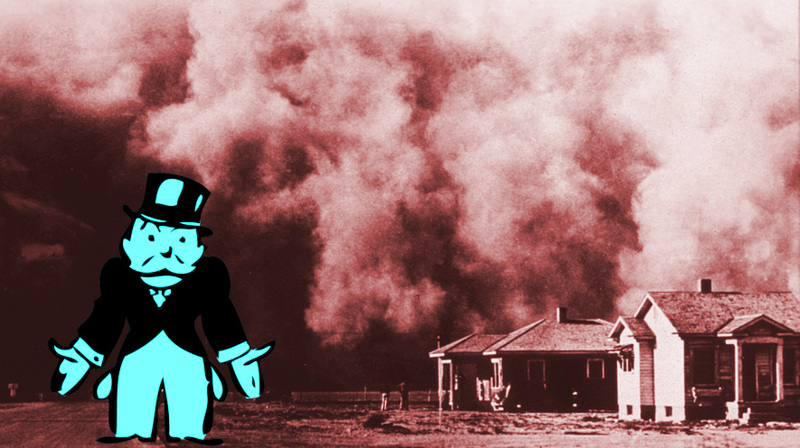 Decades of misrule in Oklahoma has produced an untenable situation. Public schools are so crowded students have to sit on the floor, sharing disintegrating, outdated textbooks. The state is stark proof of reality's well-known socialist bias, so it's no surprise that Bernie Sanders drew more primary Oklahoma votes than any candidate of any party. Teachers on four continents are leading mass protests against trickle-down, austerity politics. They join the young people campaigning for leaders like Jeremy Corbyn and Bernie Sanders, and for issues like gun control. Teachers and students spend a lot of time together, of course -- but they're also all engaged in exploring how the world works and what we can do with it. Textbooks are scarce and scandalously out of date. Innumerable arts, languages, and sports courses or programs have been eliminated. Class sizes are enormous. A legislative deal to lower class sizes — won by a four-day strike in April 1990 — was subsequently ditched because of a funding shortage. Many of Oklahoma’s 695,000 students are obliged to sit on the floor in class.